We use a high-tec Closed Loop bio-composting system at each Ladro site to help reduce waste which would otherwise be biffed into landfill. 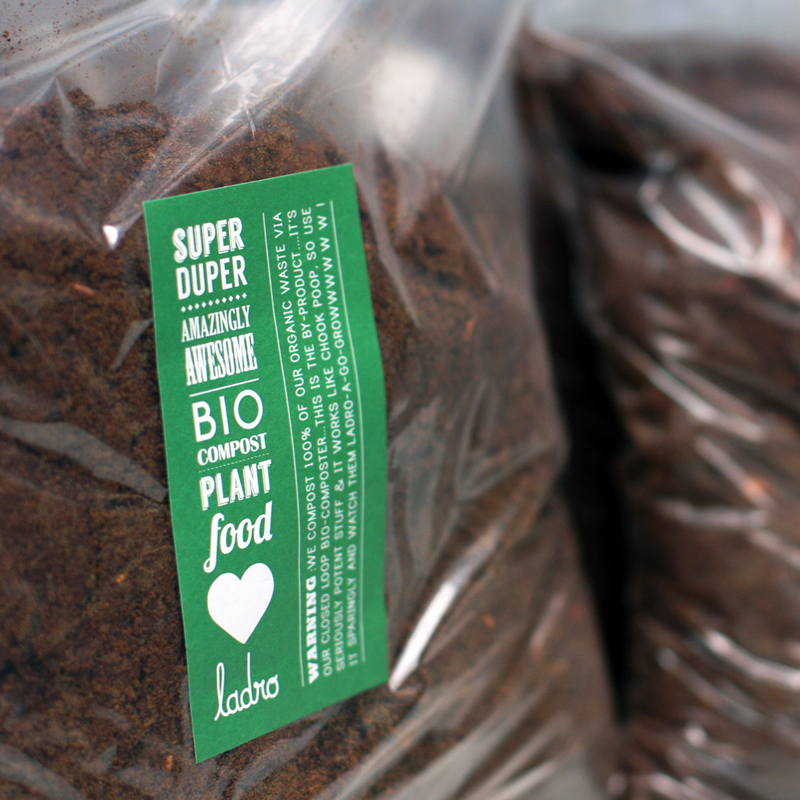 This means that 100% of our organic waste is recycled into compost…That’s zero, zippo, nada waste! We sell it back to you for $2 a bag and make regular donations to local community gardens, schools and exchange it for goods from our farmer suppliers. Win win. – Use Who Gives a Crap loo paper. – Use eco-keg mineral water by the awesome DHSMWCo. – Use 100% Aussie owned renewable energy by Momentum. – Use 100% biodegradable BioPak packaging. – Burn only sustainable timber from The Green Centre. – Make our own vino in eco-kegs for Ladro TAP. – Use only the best local and, where possible, sustainable, free-range or organic suppliers. 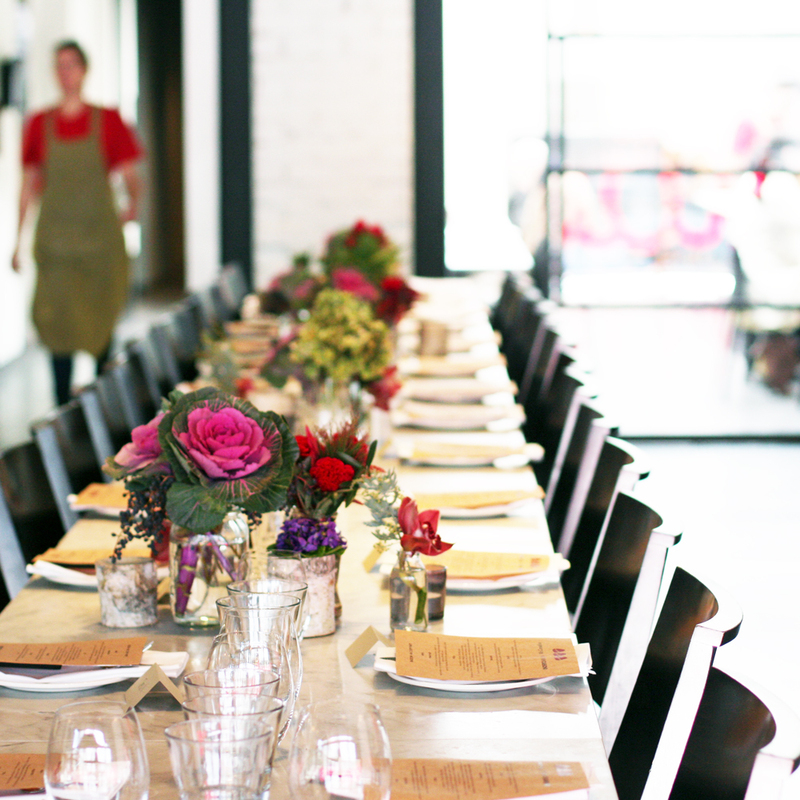 – We give back to the community with our Charity BYO $5 initiative every Monday. 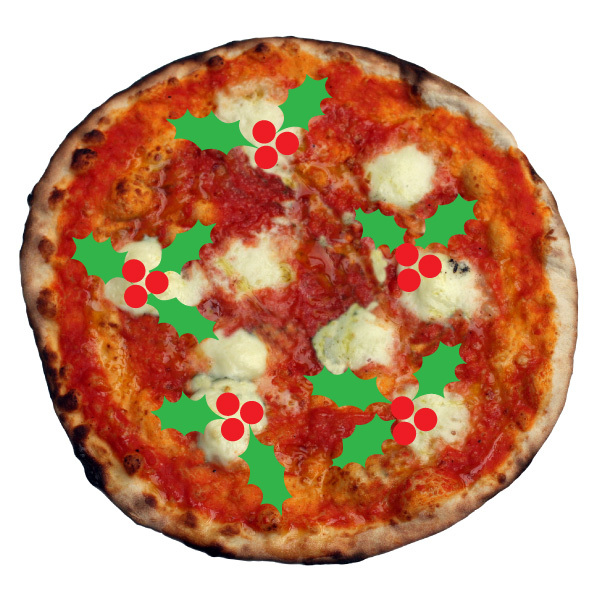 … Find out more about functions in Fitzroy or Prahran here. 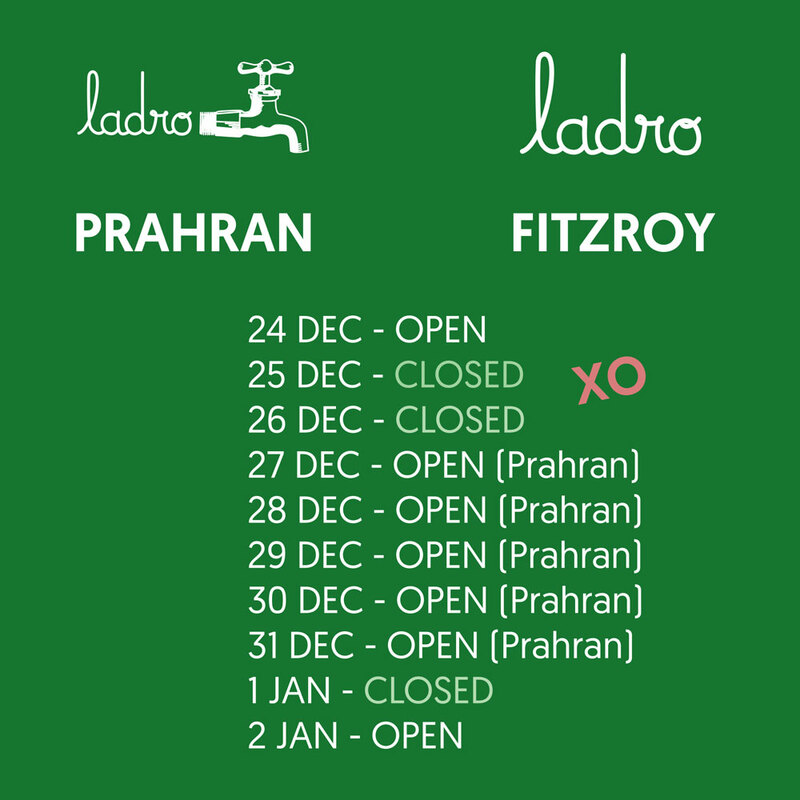 Pssst, we have a 24 hour 200 person licence in Prahran for some serious festivities! You’re invited to our next beer masterclass where we spoil you with 5 x courses matched to 5 x beers from some of the best brewers in the world [well we think so]! Next keg off the rank is the formidable AKASHA BREWERY from Five Dock outside Sydney. Relatively unknown in Melbourne, but not for long, thanks to their fine attention to detail, consistency and innovation when it comes to brewing. 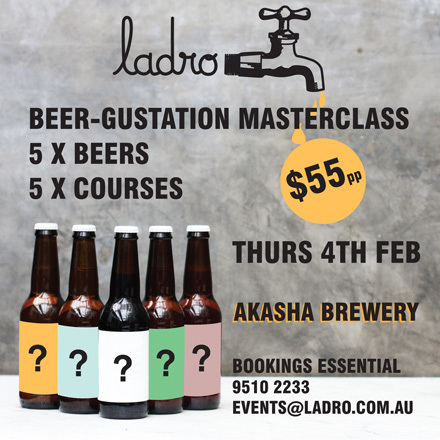 This Beer-gustation will be a bit different to those in the past…we will be featuring beers from several other breweries as well as AKASHA, all matched to 5 amazing courses from chef Arron Edwards. 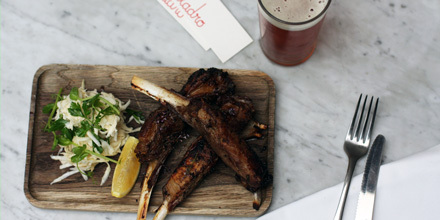 You have to admit, if you like beer, this BEER DEGUSTATION DINNER is going to be awesome! Moondog Brewery brews some of the country’s finest in the shadows of CUB down in the back streets of Abbotsford. As they say, good things come in little packages and this wee brewery is testament to that. Make this the date of your Christmas party, grab some mates or fly solo… Just be sure not to miss this beery event. 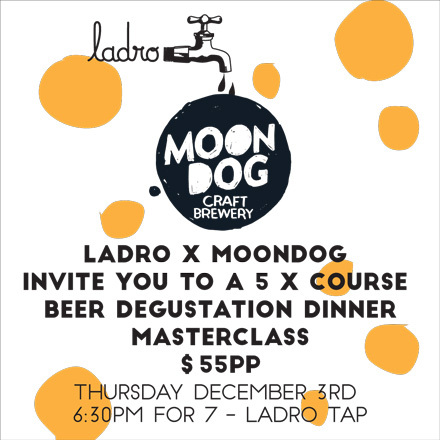 Whilst your listening to the Moondog guest speaker, we’ll be matching 5 x courses to 5 x beers for you to feast on, so be sure to BYO an empty belly. Join us at this eating + drinking Masterclass degustation where a guest speaker from the brewery will tell you everything you ever wanted to know about BEER! 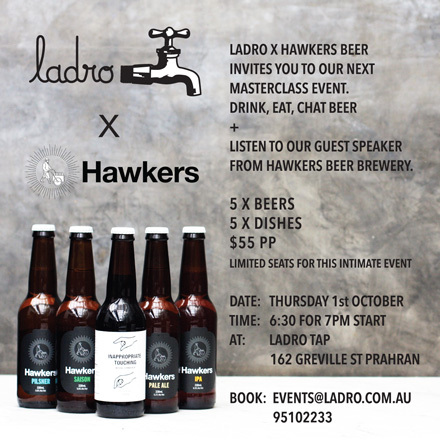 Our second Masterclass is with our friends at HAWKERS BEER . New kids on the block, these guys are busting out some seriously great brews. 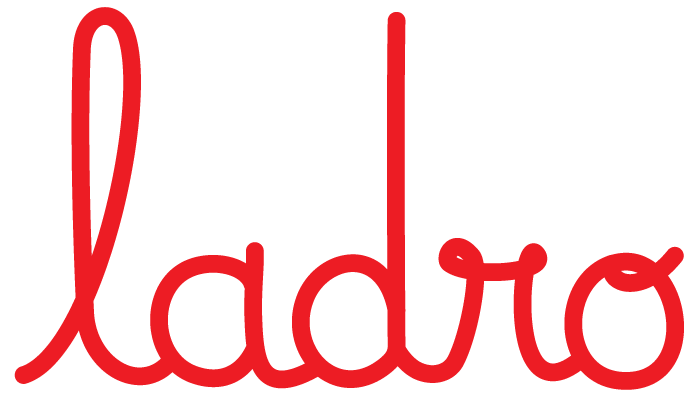 You may have sipped/ gulped the SAISON we have on TAP at Ladro…if not, embrace this opportunity to get to know Hawkers Saison, Pilsner, IPA, Pale Ale and the curiously named ‘Inappropriate Touching’ up close and personal! TIME: 6:30 for 7pm start. BOOK: Essential, seats are limited to this intimate event. Simply email or call us to secure a spot. 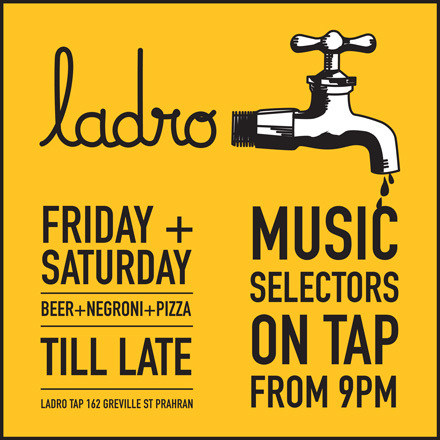 MUSIC ON TAP… every Friday + Saturday night from 9pm. With BEER + PIZZA + NEGRONI flowing until midnight, you’ll be treated to some pretty rocking vinyl sounds spun by Melbourne’s finest Music Selectors. Selectors from the famed Wax O’ Paradiso, Melbourne Deepcast + Butter Sessions, amongst others, will be featured every Friday + Saturday nights. Feel free to stick around after dinner or roll in late and take a lounge or bar seat in our new Ladro TAP area. 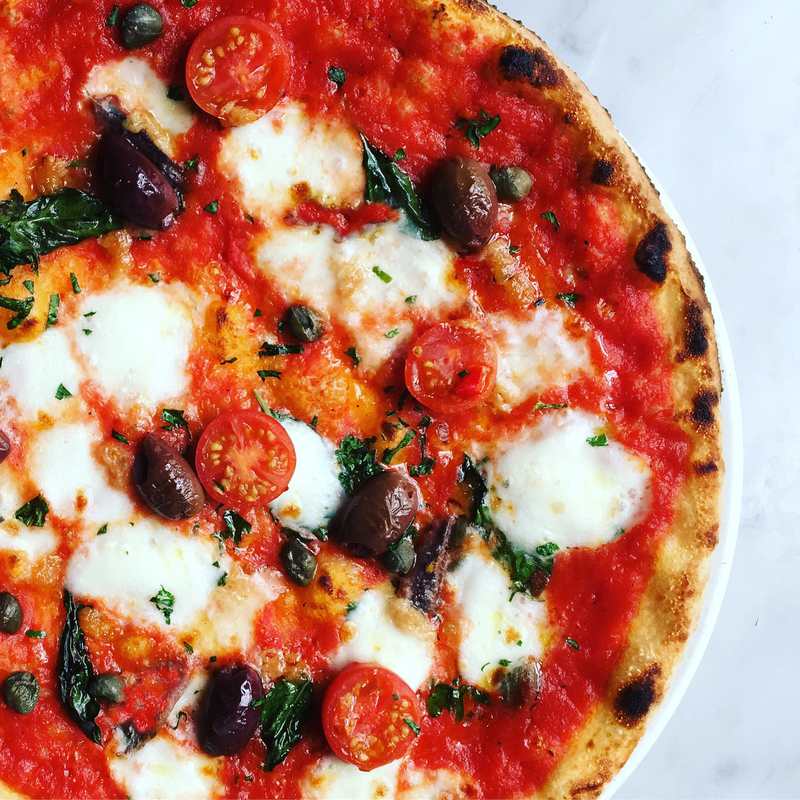 You’ll have a killer 18 TAPS of beer + vino to whet your thirst and pizza spun like only Ladro can.